A timeless Mission style, paired with the high-quality craftsmanship you'd expect from Amish furniture, our Royal Mission Dresser is sure to be a beautiful addition to any bedroom suite. On each side, a classic slat design, surrounded by a solid frame and lined with corbel trim pieces offers a true glimpse into the past. In the front, a large frame holds 12 flush-mounted, flat-front drawers that show off all of the beauty and detail in the solid wood's grain and provide a natural warmth to any suite. Opening a drawer exposes the inner workings and quality of this beautiful dresser - each one dovetailed drawer boxes, mounted to the frame with smooth ball-bearing slides that allows full-extension away from the case to provide access to all of your items stored inside. Here, you can customize this dresser to include cedar in all of the drawer bottoms to ensure proper moisture management and a beautiful aroma for your items. You can also upgrade to the undermounted drawer glides that are located under the drawer box, providing a seamless look that also includes a soft-closing mechanism to ensure you never slam a drawer again. Three solid Walnut diamond inlays grace the top cross support and offer the perfect Old World authenticity and lead you to the solid 1" thick top that is perfect for housing all of your bedroom must-haves for easy access. The optional mirror, as shown, provides a beautiful beveled edge mirror, cased in solid hardwood with the same Mission slat design, elegant corbels, and a Walnut diamond pattern inlay to tie everything together. 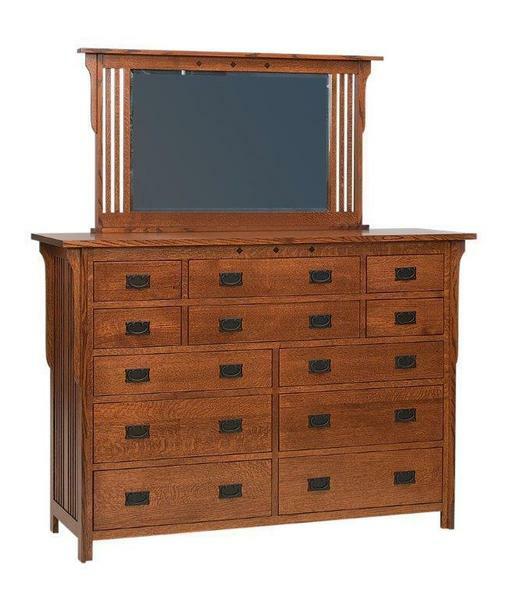 Customize our Royal Mission Dresser to match any bedroom suite. With over ten wood options and an array of stained finishes, you can be sure to find the perfect combination to complement your existing furniture, or find your favorite when redesigning your space. If there is anything else that you would like to know, or would be interested in customizing this piece even more, our team of professionals would be happy to assist! Give us a call at our toll free number, 1-866-272-6773, or shoot us an email at Questions@DutchCrafters.com with any questions you may have. Thank you for shopping with DutchCrafters!